Shimla : The Chief Minister of HImachal Pradesh Virbhadra Singh today visited the Samoh (Hirapur) in Bilaspur district, the village of Martyr Rajesh Kumar Chandel of 6th Dogra Regiment, who lost his life in an ambush by Naxalites in Manipur on 4th June 2015. 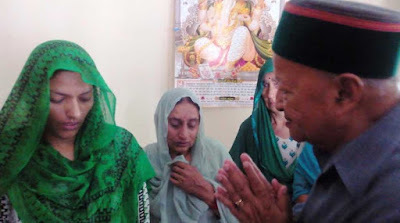 Condoling the family members after visiting their home, the Chief Minister said that the people of the State were proud of the supreme sacrifice of Rajesh Kumar while guarding the boundaries of the Nation. The Chief Minister announced that the road from Auhar to Samoh (Hirapur) be named after ‘Shaheed Rajesh Kumar Chandel’ road. Besides, the Chief Minister directed the officers to solve the water problem of the village of the martyr and install a electric transformer of high capacity to minimise the low voltage problem of the area. The Chief Minister also assured for employment to the wife of the martyr. The Chief Minister also provided financial assistance of rupees five thousand to the family members of martyr on behalf of Directorate of Sainik welfare besides, a sum of rupees five lakh 10 thousand was given by the State government to the family of the martyr earlier.